Derived from Kluwer’s multi-volume Corporate Acquisitions and Mergers, the largest and most detailed database of M&A know-how available anywhere in the world, this work by a highly experienced partner at the leading international law firm Sidley Austin LLP provides a concise, practical analysis of current law and practice relating to mergers and acquisitions of public and private companies in the United States. The book offers a clear explanation of each step in the acquisition process from the perspectives of both the purchaser and the seller. Key areas covered include: structuring the transaction; due diligence; contractual protection; consideration; and the impact of applicable company, competition, tax, intellectual property, environmental and data protection law on the acquisition process. 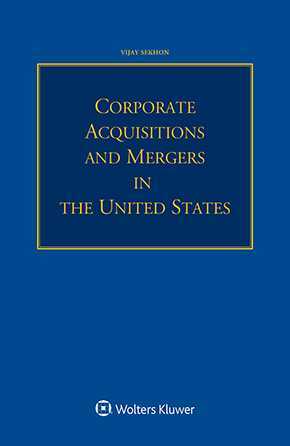 Corporate Acquisitions and Mergers is an invaluable guide for both legal practitioners and business executives seeking a comprehensive yet practical analysis of mergers and acquisitions in the United States. Equivalent analyses of M&A law and practice in some 50 other jurisdictions, all contributed by leading law firms, are accessible on-line at www.kluwerlawonline.com. under Corporate Acquisitions and Mergers. What if the Acquirer Does Not Want to Close the Deal? Listing on a National Securities Exchange.